The Federal Communications Commission is preparing for a final vote to repeal rules governing whether internet service providers can create fast lanes for certain kinds of content, or throttle the loading speeds of others. This was forbidden under so-called “net neutrality” rules imposed by the FCC under President Obama in 2015. The commission is expected to vote on the repeal on December 14, ending a process that kicked off formally this spring. Current FCC Commissioner Ajit Pai has defended the move as “restoring internet freedom,” claiming that net neutrality rules have been responsible for a downturn in investment in internet services. Columbia Law professor Tim Wu, former FCC counselor Gigi Sohn, and Ars Technica reporter Jon Brodkin discuss the implications of the repeal for customers, ISPs, companies, and other users of the open internet. Ira also speaks with Jeff Kao, a data scientist who analyzed the millions of public comments submitted to the FCC earlier this year. Kao explains why it looks like millions of those comments seem to have been submitted by bots. Commissioner Pai was invited to appear on Science Friday to join the discussion. He was unable to join this week. Gigi Sohn: He’s going to reverse [the FCC’s 2015] decision and essentially deregulate them and that’s very important for a number of reasons. The most important of which is that the FCC, when this is adopted or if this is adopted on December 14th, will have no oversight whatsoever over the broadband market. So that’s the first thing that he’s doing. The second thing that he’s doing, and it follows from the first, is that he is eliminating the rules that [Tim Wu] talked about—the prohibition against blocking against throttling against fast and slow lanes. He’s leaving in a rule that says that broadband providers have to tell you that they’re blocking that they’re throttling and that they’re providing slow lanes. And last but not least—and this is really makes it even worse—he is preempting the states. He is saying that the federal government’s not only going to regulate, but the states can do no more than what the federal government is doing. The states cannot protect consumers and competition either. Jon Brodkin: [Commissioner Ajit Pai] says the Federal Trade Commission will step in and using the antitrust laws, and you know forcing companies to keep their promises. But in the case of Comcast throttling BitTorrent, he says that that should have been handled as an FTC issue but that happened in the real world and we know that the FTC did nothing. So I mean even his example of how the Federal Trade Commission could regulate has already been disproven. Gigi Sohn: Let’s say you’re a small business and you sell chocolates. And Godiva sells chocolates. Godiva can pay to get faster service to the customer. You as the small person, let’s say you’re in Utah, probably not going to have that kind of money to pay. So your website is going to come up slower than Godiva’s. And there’s already been a lot of studies done about how long people wait for websites to load. It’s like three seconds. So you’ll be at a distinct disadvantage in that regard. Gigi Sohn: The answer is absolutely yes. I mean there would be no protection against that. I will say, I’m not as concerned about blocking as I am about fast lanes and throttling, but yes, it would be possible, because there would be no oversight for that. Tim Wu: I think they’re going to strike down, if it passes, this rule. There is a principles of administrative law that say that courts can’t jettison something that’s been relied on for a very long time unless there’s a good reason, usually a change in conditions. And this policy has been a great success—internet economy is the golden goose of the U.S. economy, been that way for a while. And so it needs a good justification. I don’t think [FCC chairman Ajit Pai has] got much. His biggest claim is that cable and phone companies aren’t making enough money, that they need to make even more because they need greater incentives to invest. I think he’s got an uphill battle and the panel may strike it down. Jon Brodkin is a Senior IT Reporter for Ars Technica. He’s based in Massachusetts. Gigi Sohn was the president and co-founder of Public Knowledge and was a former counselor for Tom Wheeler. She’s also a Distinguished Fellow at Georgetown Law’s Institute for Technology Law & Policy. She’s based in Washington, D.C.
Jeff Kao is a freelance data scientist in San Francisco, California. Tim Wu is a professor of Law at Columbia Law School in New York, New York. IRA FLATOW: This is “Science Friday.” I’m Ira Flatow. Not quite as white hot as the tax bill being debated this week but just as controversial in some circles, is the debate over the fate of net neutrality. Those are the rules that keep your internet service provider from putting some content, let’s say Netflix, in a slower lane then, say, the video streaming service that they might own. The Federal Communications Commission is on track to roll back the 2015 rules relating to net neutrality, oh, in a couple of weeks. FCC Commissioner Ajit Pai, defending the proposal repeal, has said the internet wasn’t broken in 2015. So why were these, quote, burdensome regulations necessary at all? He also said that unless rules might be stifling– he also said the rules might be stifling the very competition that many people feel that the market needs. We actually asked him to come on the program, and at least so far, he has not taken advantage of our invitation. So just what is net neutrality and what does the proposed repeal mean for your favorite Netflix or Amazon show? What do small start-up companies have to fear from net neutrality? And since broadband internet service is already controlled by virtual monopolies, how many cable companies or internet providers do you get to choose from today? One or two? Well, does the average consumer actually have any choice, whether the internet is, quote, neutral or not? What difference does that make? That’s what we’re going to be talking about today. We’d like to hear from you. Our number, 844-724-8255. 844-724-8255. Also, you can tweet us @scifri. Let me introduce my guests to start things off. Gigi Sohn, a former counselor for the FCC, who helped create the 2015 rules, Kim Wu, a law professor at Columbia, creator of the term “net neutrality,” and Jon Brodkin senior IT reporter at Ars Technica. Welcome to “Science Friday,” all of you. GIGI SOHN: Thanks. Great to be here. IRA FLATOW: Nice to have you Tim, as the person who invented the term “net neutrality,” back in, oh, that ancient year of 2003, remind folks at home what it is we’re actually talking about. TIM WU: Yeah, so I think it’s not that complicated. It just says that users have right to get the content that they want, use the applications they want, attach what they want to their connection. So it says that the carrier, you know, the phone companies, cable companies can’t block stuff, can’t throttle Netflix, and can’t upgrade some stuff and downgrade other stuff. So it’s sort of fairly basic principles. IRA FLATOW: And Gigi, Ajit Pai is proposing to do away with the FCC’s authority to regulate this. What exactly would this change in the law regarding internet service providers, how would that change things? GIGI SOHN: So basically, what the chairman has proposed is three things. First, he’s proposed to deregulate broadband. So in other words, right now, as a result of the 2015 order that I was a part of, internet access– we’re not talking about the internet. Let’s clarify that. We’re talking about the on ramps to the internet provided by companies like Comcast and AT&T and Verizon and Charter. We said that those companies were like utilities, right? They were essential part of the American economy, of the American culture, and they needed to be regulated as such. So he’s going to reverse that decision and essentially deregulate them. And that’s very important for a number of reasons, the most important of which is that the FCC, when this is adopted, or if this is adopted on December 14, will have no oversight whatsoever over the broadband market. So that’s the first thing that he’s doing. The second thing that he’s doing, and it follows from the first, is that he is eliminating … the prohibition against blocking, against throttling, against fast and slow lanes. He’s leaving in a rule that says that broadband providers have to tell you that they’re blocking, that they’re throttling, and that they’re providing slow lanes. And last, but not least, and this is– really makes it even worse, he is preempting the states. He is saying that we are not only going to deregulate, the federal government is not only going to deregulate, but the states can do no more than what the federal government is doing. The states cannot protect consumers and competition either. IRA FLATOW: Jon, what do you say about that? JON BRODKIN: Well, that’s correct. He’s removing the authority to regulate broadband providers as common carriers. And I mean, the first, the core net neutrality rules prevent ISPs from blocking, throttling traffic, or from charging for so-called fast lines. And then there are other things like there are rules that you have to disclose certain things to consumers, like how data caps will affect them, and you know, all the hidden fees they might see. And there are certain legal rights that consumers have under the statutes, such as the right to sue in cases of unfair or unjust– sorry, no– unjust or unreasonable behavior, so that right to a lawsuit over general behavior would go away. IRA FLATOW: Tim, Pai has also– I’m sorry. JON BRODKIN: Oh, yeah. Yeah. The state thing is he is trying to overturn or prevent states from imposing their own net neutrality rules, but I would expect that would be challenged in court, among others things. IRA FLATOW: Tim, Wu, Pai has also said net neutrality is a solution, quote, in search of a problem and that the internet wasn’t broken in 2015, so why require new regulations? But Tim, you were talking about net neutrality way back in 2003. So how do we actually get here? TIM WU: Yeah. This is a piece of deliberate revisionist history. I want to be very serious about this. This is a radical change. It undoes decades of FCC oversight of the phone and cable companies and leaves them, as Gigi was saying, just free to do whatever they want, as anti-competitive or anti-consumer as it may be. You know, the first concern– I was doing research on this earlier– the FCC actually first got interested in this in the ’70s, when it was worried that AT&T, then the monopolist, was going to kill the first online service providers, very early stuff like CompuServe. At least states– you know, modern net neutrality dates to 2004, when the Bush administration was concerned about phone companies blocking voice over IP. That’s extremely anti-competitive. You know, without net neutrality rules, Netflix would have been killed, you know, from the get-go, obviously. Why would cable companies allow Netflix to exist? So you know, he’s talking about allowing a power to block, which has not been tolerated since even the ’70s, and it’s a radical change, which is one of the reasons I think it’s going to have a tough time in the courts. IRA FLATOW: Jon, do we have any evidence that the ISPs actually want to put in these so-called fast lanes or slow lanes? Didn’t we hear Comcast and Charter say things earlier? They may have changed their minds? JON BRODKIN: Well, Comcast had been saying for years on its web page that, I think the exact quote was we do not do paid prioritization or fast lanes. And then I figured out this week, that on April 26, the day Chairman Pai released his plan to repeal net neutrality, Comcast deleted that commitment from its web page. Now, they’re still saying they have no plans to do paid prioritization, but you know, pulling back from the commitment that makes it easier for them to do it later, because if they promise something and then fail to uphold that promise, the Federal Trade Commission could step in. And just as a final point, remember that in 2008, Comcast was punished by the FCC for blocking or throttling BitTorrent and then the FCC’s order was overturned in court when Comcast sued, and then, ultimately, that is what led to the FCC implementing net neutrality rules. TIM WU: Yeah, can I jump in here and talk about that solution/problem thing? Comcast– the other companies have a long history of blocking stuff that they don’t want. Comcast actually blocked VPNs in the early 2000s. AT&T didn’t want Wi-Fi devices to be attached. As you said, Comcast blocked peer-to-peer file– peer-to-peer video. There was blocking by AT&T of Skype on the iPhones. So there’s a long history, and there’s no reason to expect they wouldn’t want to do more blocking in the future. I mean, if you’re a cable company, why do you want Netflix to succeed? Why do you want some new challenger to come at you? They have a lot of reasons to want to block or throttle. GIGI SOHN: But if I can get back to the fast lanes– so the FCC, in 2010, adopted the first set of net neutrality rules. And when the case went to court, Verizon’s lawyers stood up in open court and said, this is what my client wants to do. And if you look at the record of this proceeding, this new proceeding to repeal net neutrality, AT&T says, this is what we want to do. And if you read the draft order that Chairman Pai has put out, it is a golden invitation to do fast lanes. Now, they use different language, right? They use language like innovative business models and two-sided markets, but they’re all talking about the same thing, that some online providers can pay for faster and better service and those without money go to the slow lane. IRA FLATOW: Mm-hm. Let me see if I can get a call in before we have to go to a break. Let’s go to Amy in Manhattan. Hi, Amy. AMY: Hi. I know that in some areas– well not internet only but phone, there are alternative services. Like, if you don’t like the way Google operates, there are services like DuckDuckGo, and phone service, there’s CREDO. And I wonder if there are any prospects for alternatives to these ISPs? IRA FLATOW: Good question, because half the country only is allowed one ISP and the other half has a choice between two. GIGI SOHN: Well, it’s actually worse than that. So by Chairman Pai’s own numbers, 58% of census blocks in this country have zero or one internet access provider at the speeds the FCC considers broadband and 87% have two or fewer. So there’s no competition. And if, again, I can refer back to this decision that’s going to be voted on in December 14, the Chairman not only proposes that two is fine, he actually also says monopoly is fine. I think the American people wouldn’t agree with that. IRA FLATOW: Tim, you said in a New York Times op ed that the courts will be left to decide on net neutrality. What do you think they will say? TIM WU: Well I think they’re going to strike down this, if it passes, this rule. You know, there’s principals of administrative law that say that courts can’t jettison something that’s been relied on for a very long time unless there’s a good reason, usually a change in conditions. And you know, this policy has been a great success. Internet economy is the golden goose of the US economy. It’s been that way for a while. And so, you know, he needs a good justification. I don’t think he’s got much. His biggest claim is that, you know, cable and phone companies aren’t making enough money, that they need to make even more because they need greater incentives to invest. I think he’s got an uphill battle, and a panel may strike it down. IRA FLATOW: Tim, I know you have to go. So I want to thank you for taking time to be with us today. TIM WU: Sure. Thank you. IRA FLATOW: How do you spot a bot in all of these comments? JEFF KAO: Well, I think, one important thing to note is that, you know, when you’re just looking at the text, it’s very difficult to tell, you know, between one comment and another whether it’s fake or not. But when you look at the distribution of a set of comments, it’s fairly easy to tell, you know, whether something was, I guess, you know, a naturally occurring, naturally distributed set of comments or something that seems more artificial that was placed there intentionally. IRA FLATOW: Now, the FCC says it’s aware of the bots, and it’s claiming that’s a reason to dismiss the comments process entirely, that the most, quote, suspicious activity was that supporting internet regulation or net neutrality. What do you think? JEFF KAO: Yeah. To be honest, I don’t really see the evidence for that. So first of all, you know, granted, there are comments, you know, on both sides that appear to be faked, you know, that I will, you know, accept as true. However, you know, there’s internet platforms out there who’s, you know, who’s very survival depends on, you know, weeding out the bad comments from good. And you know, there’s methodologies out there, you know, some of which I’ve used, to weed out the bad from the good, and you know, you can still come to the conclusion that, you know, there’s a certain preponderance of the public that feels a certain way about the issue. IRA FLATOW: I’m Ira Flatow. This is “Science Friday” from PRI, Public Radio International. And as a follow-up, it’s important to note that those that have been identified as bots have also used real people’s email addresses. JON BRODKIN: Yeah, I got some of those same emails from people, actually. IRA FLATOW: Gigi, how much weight do these comments tend to have with the FCC anyway? GIGI SOHN: Well, they have a lot of weight, as they should. And I think it’s very unfortunate that the chairman has decided that legitimate, one-page comments are not important in his mind. They’re really important. And a lot of those one-page comments, I’ve actually taken the time to look through the docket, because I wrote a piece about how you can write an effective FCC comment in the net neutrality proceeding. And I actually saw quite a few people write on that subject, write, actually follow some of my template and those go to the actual merits of this proceeding. What the chairman is saying here is, if the document isn’t produced by a law firm or lawyers, I’m not going to even look at it. So what he’s doing by, number one, ignoring these fake comments, and number two, disregarding short comments is he is putting his case more in peril than it already is. I mean, a court is going to look at this process and say, why didn’t you investigate this? You know why didn’t you try to weed out what was false and what isn’t? They’ve basically said, the FCC has basically said, we don’t have the resources. We’re not going to bother, and we don’t care about short comments, anyway, which is the complete opposite, I might say, of what we did, when we had four million comments in 2014 and 2015. IRA FLATOW: So it is possible. Let me bring Jeff in on this, too. It is possible to weed out the bot comments. JEFF KAO: Yeah. Based on the text, I think you can, at least, get sort of a level of certainty about each block, or a campaign of comments that’s submitted. And you know, from my research, what I found was, you know, the more certain you were about the authenticity of the comments, the more likely the commenter was to support net neutrality. And so you know, that, I think, you know, obviously, this is sort of a surface investigation, but it only means that we should really dig deeper on this and try to figure out what’s going on here and what’s at the heart of, you know, these decisions by the FCC chair. IRA FLATOW: Well, we have to let Jeff go. Thank you for taking time to be with us today, Jeff. IRA FLATOW: Jeff Kao is a data scientist, based in the Bay Area, author of a new analysis of FCC comments on net neutrality. We’re going to still continue after the break with Gigi Sohn and Jon Brodkin, and we’ll return after the break with more on the end, perhaps, for net neutrality as we know it. Our number, 844-724-8255. You can also tweet us @scifri. Stay with us. We’ve got lots more after the break. You’re listening to “Science Friday.” I’m Ira Flatow. We’re talking about net neutrality with my guests Gigi Sohn, Fellow at Georgetown Law, former counselor of the FCC, back when the 2015 net neutrality rules were first drafted. Jon Brodkin, senior IT reporter for Ars Technica, he has been covering this issue closely. We’ve got lots of phone calls, lots of questions, lots of tweets coming in. Let’s see if I can get to some of those. Let me go from– Amy tweets in, would the end of net neutrality allow net providers to block the transmission of messages or messengers that they don’t agree with? Gigi? Jon? GIGI SOHN: Yes. I mean, the answer is absolutely yes. I mean, there would be no protection against that. I will say, I’m not as concerned about blocking as I am about fast lanes and throttling, but yes, it would be possible, because there would be no oversight for that. IRA FLATOW: Let’s go out to, then, a question from Brian, in Bushwick New York, about this. Hi, Brian. BRIAN: Hi. How are you? Great show. I’m really glad to hear about it, because I’ve been hearing so much about net neutrality. My question was, you all– I’m really impressed with the knowledge and the kind of arguments you’re making, but as a consumer of the internet, I was just really wondering if you could speak about very specific, like specific things that are going to affect the consumer. Like, I you know, subscribe to Netflix. I want to use the internet to sometimes sell things on certain sites. Friends of mine, like, you know, go to bandcamp.com. You know, and I’ve been hearing that that’s going to be charged for, just to enter the site. So I was just wondering for a basic user, like, what, if you could give a few examples, even your own, of just, like, what’s going to be a problem for us? IRA FLATOW: Good question. Jon, you want to tackle that first? Yeah? JON BRODKIN: Yeah. There’s one good example. Back around 2013, for many months, Netflix was extremely slow on Comcast, Time Warner Cable, Verizon, and AT&T, and the reason was Netflix was having these disputes over whether they should have to pay for what’s called network interconnection. It’s a direct connection to the network. So that went on for a while and until Netflix paid the ISPs. So what the rules did, it didn’t outlaw that sort of payment, but now, there is a complaint process that basically prevents those disputes from getting out of hand and actually harming consumers. So since the rules went into place in 2015, this problem has basically disappeared. But that complaint process is going to go way, and so if there are future disputes between– it probably won’t be Netflix next time, but someone else and the ISPs, there basically wouldn’t be anything to stop those disputes from harming customers. GIGI SOHN: Can I give an example, Ira? GIGI SOHN: So let’s say you’re a small business, and you sell chocolates, OK, and Godiva sells chocolates. Godiva can pay to get faster service to the customer, OK? You, as the small person, let’s say you’re in Utah, probably not going to have that kind of money to pay. So your website is going to come up slower than Godiva’s. And there’s already been a lot of studies done about how long people will wait for websites to load. It’s like three seconds. So you would be at a distinct disadvantage in that regard. And imagine if you’re a startup and you go to an investor, and you say, I’ve got this great online business, and the first thing I have to do is negotiate carriage with every single internet service provider in the country. What do you think that investor is going to say to you? Probably going to say bye-bye. I’m not going to invest in you. IRA FLATOW: Wow. And so how do we get competition here? Is there any way to encourage more competition? GIGI SOHN: Well, I think Jon and I are both big fans of communities building their own broadband. Unfortunately, state legislatures in about half the states in the nation have prohibited their local communities from determining their broadband future. I think those laws definitely have to go. I do see, you know, in the absence of other, more radical regulation, which I don’t think this FCC is going to do, I think that’s really the best hope for any competition. JON BRODKIN: There’s also one other thing that might help, but of course, it’s not an immediate thing. There are several companies, including SpaceX, that are developing a new kind of satellite system that could be much better than the current one. The satellites would be closer to the earth, and therefore, there would be fewer delays in transmissions. If that ends up coming to fruition a few years from now, you could finally have some real competition against the cable and fiber providers. But I mean, I couldn’t predict whether that will really take off. GIGI SOHN: So 5G is provided by the same mobile wireless providers. But I have to– I have to put a word of caution. I agree with Jon like 99.9% of the time. You know, we like to talk about all these new technologies that are coming down the pike, but until they’re actually on the ground and working, I think we have to be careful about, you know, doing any kind of competition analysis. There used to be something back in the day, only about 10 years ago, called broadband over power lines. We were going to get our broadband over the same lines that provide our electricity. And the FCC actually deregulated, in part, based on the coming arrival of broadband over power lines. And guess what? Nobody has broadband over power lines. So I would love to see, you know, satellite become more reliable. Again, 5G is super fast mobile but still delivered by the same companies, but it’s still not here yet. And while I’d love to see it thrive, I don’t think we should be making policy based on its arrival. IRA FLATOW: One of the questions though, as everybody who’s on the internet, almost everybody is on the internet, is whether the internet should be regulated like an essential utility, our water, our power, you know? Shouldn’t everybody be guaranteed good access to the internet? What’s the case for Facebook, for example, access being as essential as electricity? JON BRODKIN: I don’t know. I don’t consider Facebook as essential. IRA FLATOW: Well, but the point being, that, you know, just about everything we’re going to be consuming, and you have Apple and these other companies saying they’re going to start providing digital services. There will be no living without it. GIGI SOHN: Look, I think it’s really important, Ira, to distinguish between internet access and services like Facebook, like Google, like eBay, that ride on the network, on the edge of the network. As powerful as Facebook and Google and Amazon are, they don’t provide access to the internet. And I do think that those, including Chairman Pai, who want to repeal the net neutrality rules, are trying to change the conversation. Chairman Pai gave two remarkable speeches last week, basically saying all the problems are Twitter’s fault, OK? Twitter has nothing to do with net neutrality. Google has nothing to do with net neutrality. Net neutrality is about the on ramps to the internet that are highly consolidated, that serve this gatekeeper role, and whether they should be able to favor or discriminate. So people need to keep their eye on the ball. You know, folks have a lot of problems with what some of the big tech companies are doing, but that’s a separate conversation that is not going to be handled at the Federal Communications Commission. IRA FLATOW: Well, is the FCC the right person, then? IRA FLATOW: Or the right organization to regulate this? Where should it be? GIGI SOHN: Well, I think you’ve got to shore up anti-trust laws, and there’s a big conversation going on in the country right now about whether or antitrust laws are good enough and strong enough, and I don’t believe they are. I do believe those need to be strengthened. Privacy is a major problem and control of data. You know, those are the kinds of conversations that we need to have in Congress and we need to have at antitrust authorities. But the Federal Communications Commission was set up in 1934 to regulate networks, not to regulate the content that rides over those networks, and I’d like to keep it that way. 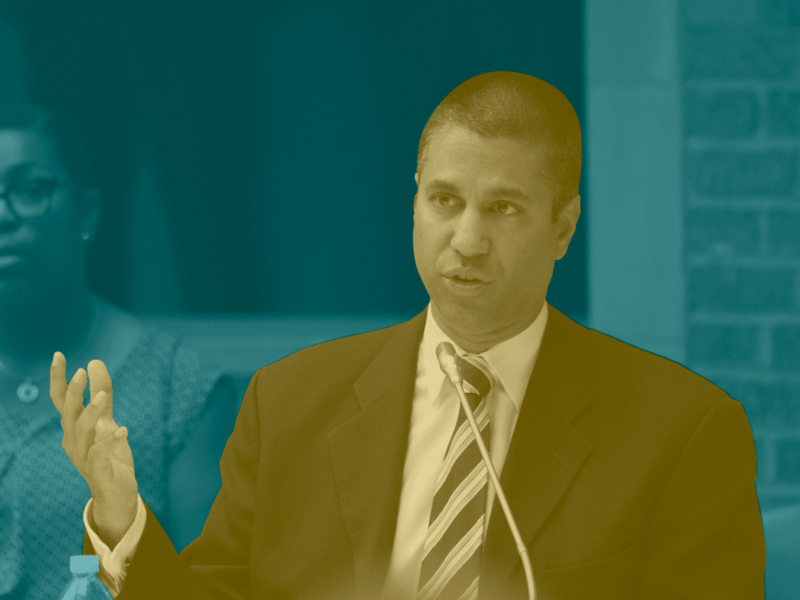 That might not sound– that might sound weird for a liberal like me, but I think the FCC does just fine regulating the networks The worst part of this whole thing is that if Pai’s plan passes, then the FCC will have no oversight over access to the most important network of our lifetimes, and it really shouldn’t be that way. IRA FLATOW: And so who would? No one? JON BRODKIN: Well, can I– he says the Federal Trade Commission will step in, using the antitrust laws and you know, forcing companies to keep their promises. But in the case of Comcast throttling BitTorrent, he says that that should have been handled as an FTC issue. But that happened in the real world, and we know that the FTC did nothing. So I mean, even his example of how the Federal Trade Commission could regulate has already been disproven. IRA FLATOW: OK. We’ve run out of time for this hour, but we will pick this up again. I want to thank both of you for taking time to be with us today. Gigi Sohn, Fellow at Georgetown Law, former counselor of the SEC. John Brodkin, senior IT reporter for Ars Technica. He’s now– well, he’s been covering this issue very closely. Thank you both for taking time to be with us today. GIGI SOHN: Great to be here. Thanks.